Living in "LUXURY" is the only way to go! A place to sleep and a place to eat  What more could you ask for? Frederick Harvesting provides the best living arrangements for its employees. During the harvest season, each of our families has a trailer house; we also have four additional trailer houses to accommodate our employees. 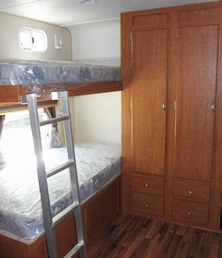 Our crew trailers are modern and equipped much like a regular house. 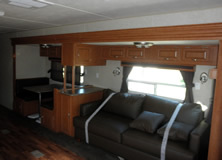 The employee trailer facilities include bunk beds, closets, washer & dryer, shower & bathroom, sitting room with satellite TV, refrigerator and, of course, full force A.C.! We provide employees with two meals everyday. Our evening meals are prepared and cooked by Lynette & Connie. Meals are eaten at the trailer houses, or in the field when we're harvesting.